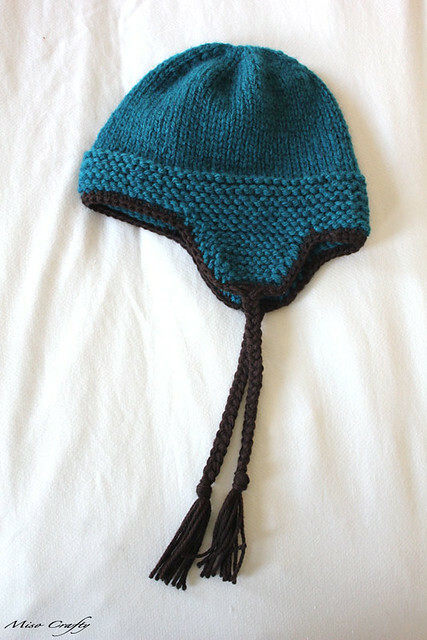 Yesterday I mentioned that I had knit the Munchkin a hat a little over a week ago. Here's proof that I did just that. I tried really hard to get a photo of him wearing it, but alas the kiddo broke my heart and has been refusing to wear it. sniff, sniff... Brett, bless his heart, is insisting that the refusal is due to the fact that it's just not that cold outside to warrant wearing a hat as warm as this one is. It still breaks my heart. My only solace has been that the Munchkin has become a bit picky and vocal about what he will and will not wear lately...right down to which pajamas he'll go to bed in! Toddlers...what can I say? Anyhoo, this hat wasn't really on the knitting agenda. Yes, I was planning on making the Munchkin a few hats, but those patterns were already picked out. This hat came to be after I discovered another bin in a closet labeled "crafts". I saw a bunch of yarn in there that I had forgotten about and this was one of them (sorry, I know nothing of this yarn and don't even know if it's still available in Victoria. My Ravelry search shows that this yarn hasn't been stashed or used that much). I had purchased this yarn back in 2008 when I had first moved to Victoria and wasn't serious about knitting. I had bought the yarn in hopes of making a cabled clutch of sorts. Yeah, back then I knew nothing about yarn, gauge, needles...nothing. I thought you just bought the yarn you liked, used the needle size that was given on the label, and it should look exactly like the pattern in the end. Man, I was so beyond clueless! I've come a long way since then!! Now, I don't consider myself a yarn snob as I do have copious amounts of Cascade 220, Knit Picks, and Patons Classic Wool in my stash but I have become a fiber snob. I prefer natural fibers and while I'm not against acrylics per se, I am quite picky about the kind and amount of it, since there are some pretty nice wool/acrylic blends out there. This yarn, well, this one is somewhat in the middle for me. It's nice and light for a bulky weight but the mix of wool, acrylic, and alpaca makes it very splitty. Yet when I saw it in the bin I knew that it was going to become a hat for the kidlet. And here you have it. I had cast on at a Friday knit night and finished the hat the next morning. I was quite surprised that I had only used a little over half of the ball. I was kinda hoping that this project would be a stash buster. I used leftover Spud & Chloë Sweater that I had used for Baby Sophisicated Stripes for the trim and braids, which I think makes the hat look polished and gives it some interest. I didn't swatch for this project, instead I went for my gut feeling and went with a needle size that I thought would give me the fabric I wanted and hoped that it would all work out in the end. 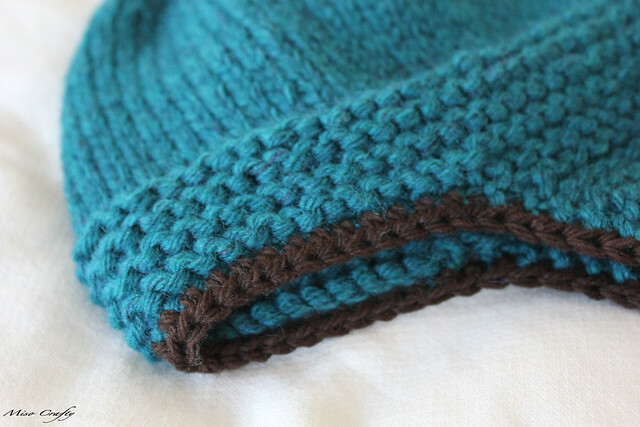 I had started out with the idea of knitting the medium size, thought I had knitted the increases for the medium, but when it came time to do the bind offs and separate the ear flaps from the front and back, turns out I had the numbers for the small. So I just went with it. Glad I did. While the hat fits the Munchkin, it's a tad too big at the crown. Can I call it a design feature and say that it's a smidge big so that there's room for the Munchkin's head to grow in to? Let's do that. So there really isn't much to say about this project. It's a super quick and easy knit, but I guess hats are like that? The pattern was easy to follow, but I'll admit I was a little confused at first as to whom the hat was suppose to fit - a child or an adult? 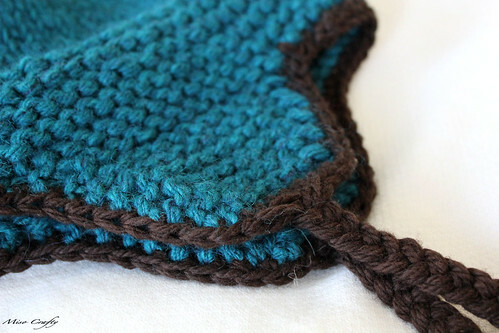 I had to peruse the project pages on Ravelry to see how the fit faired for those who knit the pattern for their toddlers. But other than that I had no issues with the pattern. I did have issues with my needles though. I thought I could Magic Loop the entire hat but found that it was taking me longer to knit that way. I don't have that many 16" circular needles, especially not in a 5.5mm (US 9) so I dug out my Denise Interchangeable set. Knitting in the round was definitely easier and much faster. Now if only getting this hat onto the Munchkin was easy. Well I think it is an adorable hat! I am sure he will come around soon. Brett's probably right! You just wait until it gets cold out, then he'll be begging to wear that awesome hat! I love the colours, I think you're totally right, the contrasting edging and tassels really pull it all together.